A tankless water heater provides space heat for the whole house. 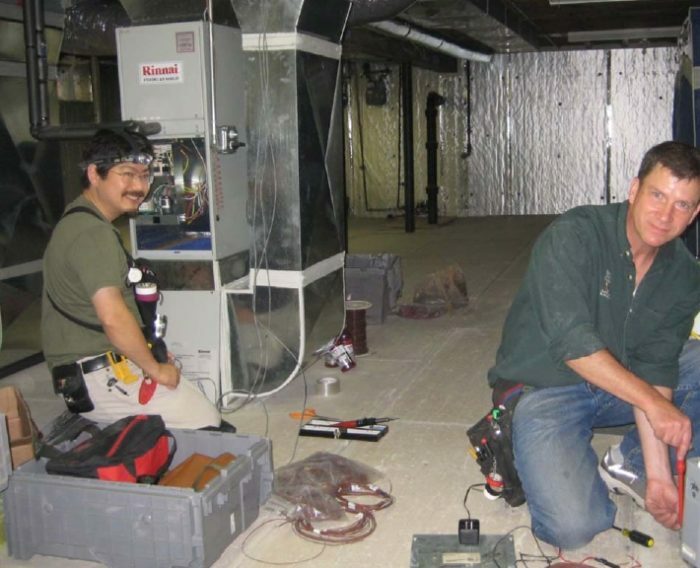 Two energy specialists from the Building Science Corporation, Kohta Ueno and Armin Rudd, install an air handler equipped with a hydronic heat exchange coil in one of the homes enrolled in a deep-energy-retrofit project in Utica, New York. Image Credit: NYSERDA Insulation was installed on top of the existing basement slabs and on the interior side of the existing foundation walls. 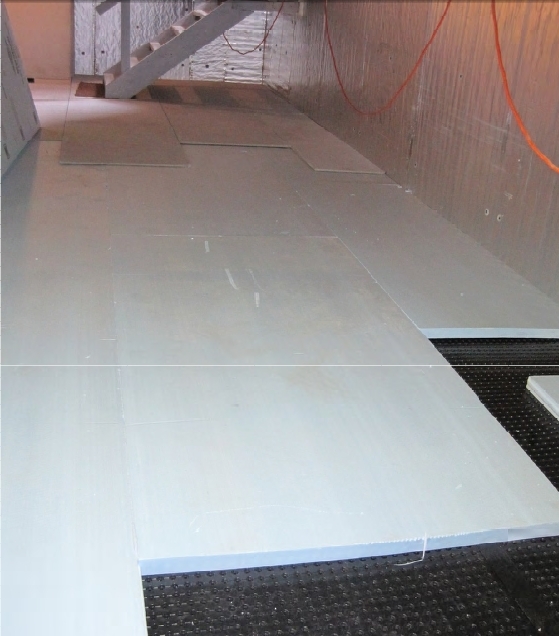 Image Credit: NYSERDA After installing a layer of dimple mat on the existing slab floors, the floors were insulated with extruded polystyrene (XPS). The basement walls received two types of rigid foam insulation. The first layer installed closest to the foundation is a type of XPS with vertical drainage grooves on the back side. The top layer of rigid foam is Thermax polyisocyanurate, which was chosen because code officials don't require Thermax to be protected with a thermal barrier like gypsum drywall. After the existing siding was stripped from the walls, two layers of 2-inch-thick polyisocyanurate were installed. The layers have staggered seams, and the seams were taped. New window bucks were installed in preparation for the new "outie" windows. 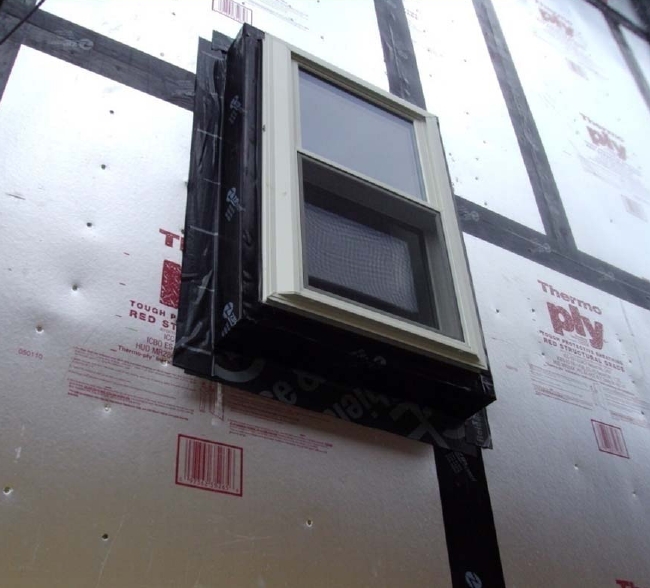 The protruding window bucks were flashed with flexible flashing before the vertical rainscreen strapping was installed. Some of the homes received new metal roofing. Before the new roofing was installed, two layers of 2-inch-thick polyisocyanurate insulation were installed on top of the existing roof sheathing. At buildings with relatively new roofing, improved insulation was installed on the attic floor. After all of the existing insulation was removed, an insulation contractor installed a thin layer of closed-cell spray polyurethane foam to seal air leaks. The attic floors were then insulated with a deep layer of cellulose. Using a single Rinnai tankless gas water heater to provide space heating and domestic hot water sounds simple. But as this plumbing diagram shows, the homes ended up with fairly complicated heating systems. 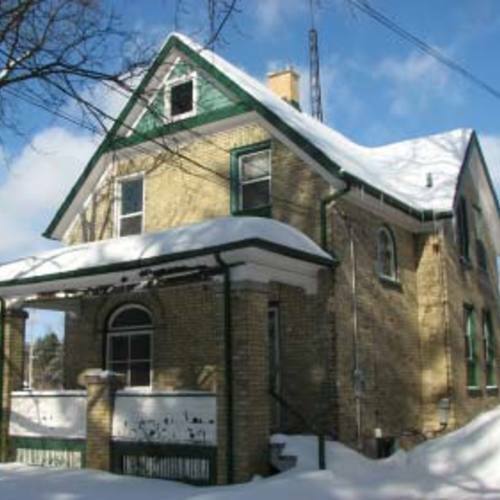 How much does it cost to perform a deep-energy retrofit at a 100-year-old single-family home? Thanks to a recent study in Utica, New York, we now know the answer: about $100,000. The research was sponsored by New York State Energy Research and Development Authority (NYSERDA), an agency that administers programs funded by public benefit charges tacked onto electric utility bills. The program paid for deep-energy retrofits at four wood-framed buildings in Utica, New York. 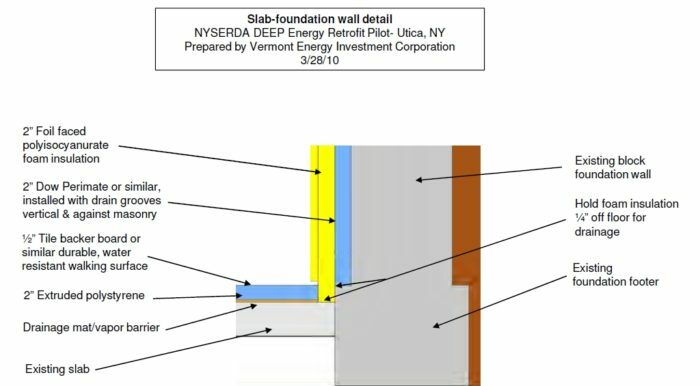 The project manager for the study was NYSERDA engineer Greg Pedrick. At the recent Better Buildings by Design conference in Burlington, Vermont, Pedrick gave a presentation, “Research Findings and Momentum for Deep Energy Retrofits,” explaining the scope of work and summarizing the costs of the retrofits. Pedrick’s team selected four wood-framed buildings; brick buildings were deliberately excluded. All are owned by low-income families who had applied for weatherization assistance. Three of the buildings are single-family homes; the fourth is a duplex. All of the buildings are about 100 years old. The work was paid for by NYSERDA; there were no out-of-pocket expenses for the building owners. Part 1: What Is a Deep Energy Retrofit? The researchers’ goal was to reduce energy use by 75%. To achieve this goal, the plan was to retrofit slab floors to R-10, below-grade walls to R-20, above-grade walls and roofs to at least R-40. The windows would be upgraded — either with low-e storm windows or new windows — to achieve a maximum U-factor of 0.25. The airtightness goal for the homes was 0.15 cfm @ 50 pascals per square foot of surface area. To insulate the basement floors, the contractors first installed a layer of Platon dimple mat on top of the existing concrete slabs, followed by R-10 rigid insulation and a layer of Durock cement board. The Durock was not fastened down; it just floats over the XPS, held in place by gravity. The basement walls were insulated with two different types of rigid foam. Next to the foundation walls, the workers installed 2-inch-thick Dow Perimate (XPS with vertical drainage grooves). The second layer was 2-inch-thick Thermax, a type of rigid foam that can be installed without a thermal barrier (that is, without gypsum drywall protection). The Thermax was held in place with cap screws. All of the existing siding was removed from the above-grade walls. 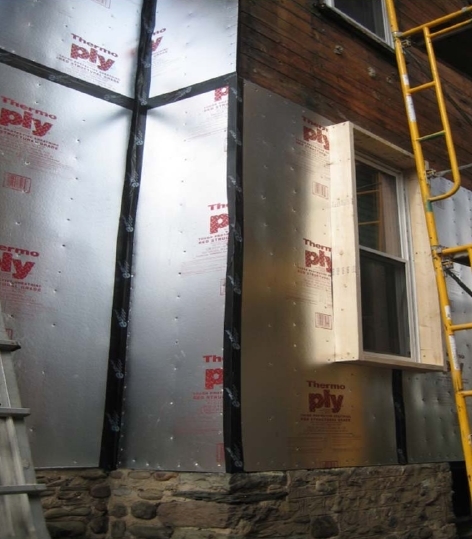 Once the walls were stripped to the sheathing boards, contractors installed a layer of Thermoply with taped seams as the air barrier. Then they installed two layers of 2-inch-thick polyisocyanurate with staggered seams, followed by vertical rainscreen strapping and new siding. New fiberglass-framed windows from Serious Energy (R480 series) were installed in most of the buildings. The windows had Heat Mirror glazing consisting of two layers of glass with a plastic film suspended between the panes (a type of glazing that performs like triple glazing). The windows were installed as “outies” in new window bucks that projected 4 3/4 inches out from the old wall sheathing. Many of the existing exterior doors were replaced with new insulated doors. Two of the buildings got new metal roofing installed over 4 inches of new polyisocyanurate. The roof strapping was extended to increase the width of the roof overhangs. Two of the buildings had roofing in very good shape, so those buildings didn’t get new roofing. 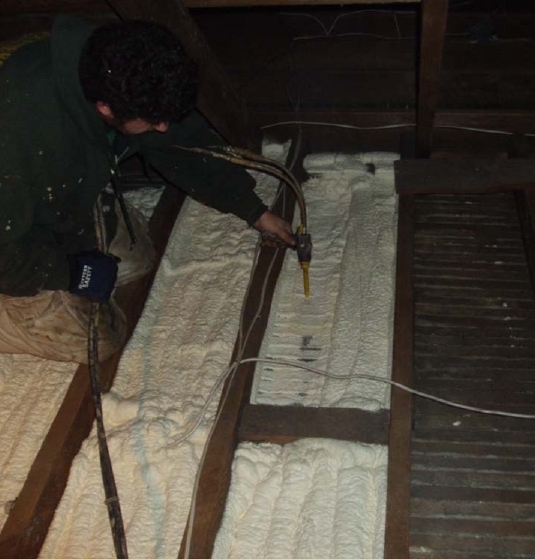 At these buildings, it made sense to install insulation on the attic floor. After all of the existing insulation was removed and discarded, the exposed lath-and-plaster ceilings were sealed from above with a thin coat of closed-cell spray polyurethane foam to seal air leaks. Then a deep layer of cellulose was installed. The design heating load of these renovated buildings is less than 40,000 [no-glossary]Btu[/no-glossary]/h. The existing forced-air furnaces in these buildings were all removed, and new hydro-air heating systems were installed. The hydro-air systems use a natural-gas-fired Rinnai tankless water heater to supply heat; hot water is circulated through heat-exchange coils in an air handler, and the space heat is distributed through the existing ductwork. The same Rinnai heater also supplies domestic hot water. To be sure that the Rinnai’s limited output of hot water is adequate, each unit is connected to a 12-gallon electric water heater (with the electric resistance element removed) that acts as a buffer and storage tank. Of course, the project’s goal was to create safe, energy-efficient, code-compliant homes. “Anything we found that needed to be fixed — we fixed it,” said Pedrick. Correcting unforeseen conditions at the four buildings cost $81,680 — an average of $20,420 per building. This was a very valuable research project. The retrofits resulted in very significant energy savings, and the gathered cost data are extremely useful. Before the retrofit work, the homes were drafty, uncomfortable, and out of compliance with local building codes. After the retrofit work, all of the homes have new siding, and some of the homes have new roofing and windows. All of the homes are safer, more comfortable, and less expensive to operate. However, the energy savings alone can’t possibly justify the very high costs of this type of retrofit. The average cost for the work was $112,000 per building, or $89,783 per housing unit. The average annual energy savings was 393 therms of natural gas (11,486 kWh) per housing unit. Since the cost of natural gas in Utica is $1.65 per therm, the average annual energy savings are $647 per housing unit. In other words, the simple payback period for these retrofits was 139 years. If the same amount of money ($89,783 per housing unit) were invested in a photovoltaic (PV) array instead of a deep-energy retrofit, you could buy a 20-kW PV system with an annual electrical production of 22,401 kWh (worth $3,248 at the local electricity rate of 14.5¢ per kWh). The value of the PV electricity would be 5 times the savings achieved by the deep-energy retrofit. Nice review of the research project. I have always questioned the value of deep energy retrofits on some homes. The acolytes of these projects seem to believe that every house deserves this level of improvement, but I think that there are situations where we are better off deconstructing a house and building a new one instead of retrofitting existing. I like the point you make about solar PV making more financial sense than the level of improvements on this house, but we do need to consider the environmental impact of the manufacturing of PV panels. There are also the issues of using foam insulation and the global warming and other impacts of those products. As in most issues with green building and energy efficiency, there is rarely a single, straightforward answer, and that's what makes it interesting. Thanks for the information. Q: Did the use of the buffer tank restore the full Rinnai Warranty period? Thanks for approach to my basement floors. That will work and can be done at a later time. I think you should not include the 20K of code compliance work in the DER cost payback numbers. Doesn't change the relative between DER and PV but is more directly energy related. Generally this work is best done when the service life of the relevant element is near its end anyway - so buildings that need new cladding are already committed to a quotient of the expense. This work is also best done (justified) when other remodeling (to improve function or aesthetics) is being contemplated - same deal, there is already a commitment to some expense and mobilization. Both these realities suggest this work makes more sense when done in phases. Getting clear on goals helps provide focus and can frame decision making - what are we chasing? And there are a whole stack of design/engineering/planningtraining/monitoring costs that I doubt are reflected in the project totals. There is a great podcast about design called "99% Invisible" which calls our attention to the thinking that (hopefully) precedes the doing. I once graphed the people, the time, and the coordination required to do this work (that 20th century thinking glossed over) and it was as daunting as the first time I sat down and came to terms with the real costs of running a business (and how much I needed to raise my rates). And on that last subject - if the project is done without subsidies - there is the sales process and a lot of time educating the client (and probably ourselves) on the way to the sale. Converting an old, energy guzzling house to an energy miser is a Herculean task, this study should give us a reason to build better new homes. I have found some homes built in the 70's and 80's can be made much more efficient with a reasonable cash outlay. The numbers have to add up, if the ROI does not work, scale back. Is this level of energy savings typical for a retrofit? Have other retrofits approached 75% energy reduction? If so, what could they have done differently here to reach that number? There ought to be some geek shorthand for amortization of energy efficiency improvements. Like total project cost on one part of the balance sheet and then an eff/25 for the percentage of the energy efficiency improvements that are paid off in 25 years. Like when you say ach50 everyone knows what you are talking about. I think the hvac could have been lower, especially since the rinai is probably not a 30 year unit in that application.I believe they make variable firing rate gas furnaces south of 3k, and they would probably more or less bolt in. Even if they only saved a grand it would pay for another inch of foam on the roof. You wrote, "I like the point you make about solar PV making more financial sense than the level of improvements on this house, but we do need to consider the environmental impact of the manufacturing of PV panels." I agree. I didn't mean to imply that it was appropriate to install 20-kW PV systems on these buildings -- after all, as John Brooks correctly pointed out, there's no way the roofs of these buildings could have accommodated such PV systems, even if they made sense. What I wanted to show is how much of a PV array $89,000 would buy, to provide some perspective to evaluate the 11,486 kWh per unit per year that was saved with these deep-energy retrofits. You wrote, "I think you should not include the 20K of code compliance work in the DER cost payback numbers." I understand your point. However, the issue can be seen both ways. After all, some policy-makers (mostly in Europe, but occationally in North America) are advocating deep-energy retrofits as a way to achieve carbon reductions. It is unrealistic to exclude code-compliance costs from deep-energy retrofits from a policy perspective -- after all, no one can responsibly advocate this type of work if we aren't willing to end up with a safe house. Since we need to pay attention to safety, the costs incurred in Utica are true costs. There's no way to do it any cheaper! You wrote, "Generally this work is best done when the service life of the relevant element is near its end anyway - so buildings that need new cladding are already committed to a quotient of the expense." I agree; I elaborated on this topic in an earlier blog, Roofing and Siding Jobs Are Energy-Retrofit Opportunities. You also wrote, "If the project is done without subsidies - there is the sales process and a lot of time educating the client (and probably ourselves) on the way to the sale." I'm not worried about this issue, because the number of clients interested in spending $100,000 on this type of retrofit are so few, and the marketing hurdles are so daunting, that very few contractors will every face this problem. Q. "Is this level of energy savings typical for a retrofit?" A. No. Very few energy retrofits result in energy savings of 75%. Q. "What could they have done differently here to reach that number?" A. This project reduced fossil fuel energy use by about 65%; electricity use was not reduced at all (it actually increased). I think the measures that were implemented at this project were appropriate measures, if reducing fossil fuel use was the goal. It cost about $100,000 to achieve this goal in a single-family building. If you wanted to achieve 75% reduction, you would almost certainly need to invest more than $100,000. However, as you start chasing those last few BTUs, the cost per BTU keeps getting higher and higher. The first BTU you save is always the cheapest. The last few BTUs are always the most expensive. I think most observers would say, after you spend $100,000, it's probably time to quit. In fact, it might be reasonable to quit well before you've spent that much. You wrote, "I think the HVAC [cost] could have been lower." You may be right; it's hard to say. But the conclusions I drew from this research remain the same, even if you want to quibble about the ways that some of the money could have been spent. It's possible that the researchers could have spent $1,000 less on one line item, and $1,000 more on another line item. But I don't think that would fundamentally change the bottom line by much. I think the reduction in energy use is very impressive. I was just wondering why they set 75% reduction for the goal--was that based on modeling, past experience? Or maybe they just didn't know to expect from this work and this is how they found out. Those worried about carbon emissions and global climate change have often stated that we need to develop retrofit methods aimed at achieving 75% savings in residential energy use. I think the main driver for this aggressive goal is concern over climate change. We need projects like the one in Utica to demonstrate the feasibility of such a goal and to quantify the costs. The goal is achievable -- but there may be less expensive ways to reduce carbon emissions. Of course, the energy consultants involved with this project used energy modeling software to develop the package of retrofit measures that were implemented. Thanks Martin. I wasn't aware of where that number came from, and I'm just thinking about what may be possible to achieve if similar measures were taken with my own house. I was ready to pull the trigger on a very expensive deep energy retrofit last year when I decided to take a step back and re-evaluate whether I wanted to spend the money to have a foam-encased house or a leakier house with a PV array. "I think that there are situations where we are better off deconstructing a house and building a new one instead of retrofitting existing." That makes sense. Do we compare the costs of deep-reno to building new on a new piece of "improved" real estate? Or do we compare it to the costs of buying an end of life project, deconstructing it, then building a new one on its site? I wonder if deconstruction of a residential house in an older neighborhood can be done for $100000? And if that cost is added to the cost of the new building ... is that a "favorable ROI"? What to do with an old building, an old neighborhood, an old city. Fix it, or tear it down and start over? Now there's a policy decision for you. Here's my opinion: we need to implement carbon taxes that reflect the environmental costs associated with burning fossil fuels. Since the costs of global climate change are huge and catastrophic, appropriate carbon taxes would probably double or triple the cost of energy in the U.S. Once the price of carbon-based fuels correctly reflected environmental damage, all kinds of changes would occur. Some homes would be abandoned; some would be improved. And some people would move to different climates. I would think insulating the basement on older homes would be the most challenging aspect. Many, not all, older homes have severe moisture issues. not just moisture, but standing bulk water. Some just have dirt floors, some a central drain, and some a perimeter drain to a sump pump. Some basements only flood on occasion. many older foundations are rubble, further complicating matters. You're right -- older basements cost a lot to fix up, air seal, and insulate. But if you're performing a deep-energy retrofit, you can't just address the above-grade walls and attic without addressing the basement, too. In fact, retrofit work in basements is often more cost-effective than retrofit work on above-grade walls. "That makes sense. Do we compare the costs of deep-reno to building new on a new piece of "improved" real estate? Or do we compare it to the costs of buying an end of life project, deconstructing it, then building a new one on its site? What to do with an old building, an old neighborhood, an old city. Fix it, or tear it down and start over? Now there's a policy decision for you." I live in Northern NJ, and doing some "back of the envelope" calculations, I don't see how it's possible to tear down and rebuild new in my area for significantly less than what it would cost to do a DER. I understand that there are parts of the country that have a little more elbow room, and where building new might be easier, but here in northern NJ (and perhaps other densely populated areas) it's still cost effective to do a retrofit, especially when you calculate the reduced energy usage. True cost to own is not the same as cost to build/upfront cost. But the fact is that people spend money on their homes for all kinds of different reasons, and energy cost payback is very far from the measure of value that homeowners will use to justify their substantial expenditures on other aspects of home improvement. What's the ROI of a new kitchen? A swimming pool? A 3-car garage? The only expected ROI in these cases is an increase in the value of the property, but those returns are typically only measured in pennies on the dollar - an in-ground pool can even reduce a property's market value. The projects in this study were undertaken at the expense of public utility customers with the purpose of providing data points for future public policy decisions. I hope those of us who work in the very different world of private clients with some finite amount of discretionary income to spend on their own homes are not dismayed by these numbers and can continue to help them view significant energy upgrades as valuable beyond the specific energy payback. While DER at this level will continue to be a tough sell an energy retrofit of probably more modest depth should be part of EVERY renovation project. As Martin wisely points out, the first energy upgrade dollar spent vastly outperforms the last one. This project and others like it will help us guide our customers to the highest point on that curve where they can still perceive value. The 7th picture shows a "Clearwave-HD electronic water conditioner." Are those things for real, or just a waste (!) of electricity? No, not the big bucks they undoubtedly spent on the windows: I'm wondering about the built-out window bucks that project beyond the polyiso sheathing in the photos. They appear to be built with solid lumber. In his past articles, Martin has suggested using 3/4" plywood for window bucks and building rough openings 1.5" oversized to accommodate. If these bucks are made of solid lumber, what dimensions did they use? I mean width, as well as whether they're 1x or 2x. Just wondering. What have others used? I have no comment on the electronic water conditioner, except to say that these heating systems were designed by Armin Rudd of the Building Science Corporation, and that Rudd said there is some evidence suggesting that these devices can be helpful. "I've been working with a NYSERDA project. NYSERDA wanted to utilize tankless heaters for combi systems for a pilot program up in Utica. We now have full monitoring on two systems -- one with and one without a small storage tank. "We've had problems with plugging of the inlet filter of the tankless heater. It happens a lot. The aluminum anode rod was corroding enough to plug the filter. This is a recirculation problem. If you have any recirculation, any decay of the anode rod, it will end up plugging your system. We decided to front-end it with a unit that has a stainless steel strainer. It becomes an annual maintenance thing. Before that they plugged up in a matter of weeks. Aluminum anode rods rot fast, and they put junk in the system. Now I put in magnesium rods. "When it comes to thermal performance and the ability of the systems to meet loads, we’ve had no problems, but it’s these externalities have been troublesome. If you have to clean the filter once a month, that’s no good. "We have builders asking us if we are ready to recommend this type of combi system yet, and we are saying, 'not really.' We still have problems with the high frequency of cleaning of the inlet filters. "Building America doesn’t want to recommend a system that will give us a black eye, and we want to be sure we get the savings that we are predicting. There are questions: Is it necessary to add a buffer tank or not? If you don’t have that, what are the problems?" When calculating the size of the rough opening, you have to add twice the thickness of the material used to make your buck (1/2 inch or 3/4 inch for plywood, or 1.5 inch for lumber) to the height and width, plus the usual extra amount for shimming and obtaining level, plumb, and square. You could use dimensional lumber if you want, as long as the total thickness doesn't exceed 11.25 inches, but I think that would be a waste of lumber, as well as an additional thermal bridge in your wall. Remember, a window buck made from plywood acts like a truss -- it's quite strong and it isn't going to sag. What was the value of these homes before refit ? I'm not sure. But if you want to buy a home in Utica, there are many listings from $74,000 to $150,000. There are a few for $54,000 and up. Great to see a summary of final results including costs and unmet goals to help give us all a better perspective of this type of work. I would hope that an energy retrofit would increase the market value of the home, or at the very least create a higher market value relative to comparable homes. Conversely I hope that the general public becomes more aware of many of the problems existing homes are burdened with and that the qualitative differences between houses are better reflected in their market value. Concerning the 4 projects in the study I am unclear how the described basement assembly creates an air barrier. Typically it is the poured slab that acts as the air barrier. Also I would be interested to learn more about the mechanical ventilation strategy of each of these houses. The Utica buildings all had existing basement slabs, to the best of my knowledge, and these slabs were part of the air barrier system. I have added two illustrations that depict basement details, so check out the new photos on this page. All of the buildings got new whole-house mechanical ventilation systems. I don't want to mis-report details of these ventilation systems -- so I need to verify a few details when I get a chance, and report back later on the specifics. 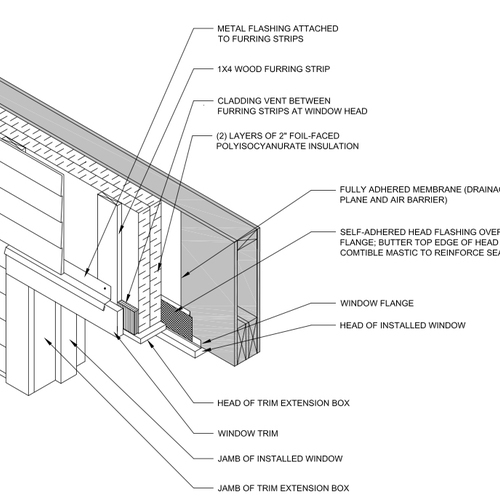 --an alternative approach removes both the old siding and sheathing, attaches a second layer of studs to the old studs connected via plywood gussets (in effect an add on Larsen Truss), then dense packs with cellulose. Re-use suitable old sheathing or add new sheathing, then install new siding (over a rainscreen gap if desired). I wonder which exterior wall DER approach might generally provide the lowest cost solution? Martin, do you know of any guidelines re which approach may be best for various climates (e.g. could old sheathing and siding between two insulation layers pose moisture considerations in some climates)? 1,200 square feet of R-10 exterior wall in a 7,000 heating degree day climate will lose 20,160,000 Btu's on an annual basis or 144 gallons of heating oil. At $3.50 per gallon the heat loss through the R-10 wall is $504.00 per year. If you upgrade the R-10 wall to R-40, the energy loss will be 25% of what it was through the walls originally or $126.00 per year for an annual savings of $378.00. How much could or should one spend to save $378.00, I would say at most, 10 to 15 times the annual savings or 4 to 6k. If you are in an area where natural gas is .70 per therm your retrofit outlay would about 2k maximum. The numbers do not add up for most deep retrofits, even with the most expensive fuels as the energy source. - If you are contemplating between "green" new construction and DER, DER is still cheaper, better for the environment and you end up with a sound house. - A simple payback for these projects do not work but if you take the "true" costs of energy it might be favorable => if you can afford it go for it. - If you do not want or can do it all at ones consider staging the process. Also it would help to break down the costs to SF! Insulating your wall to R>40 will probably cost you 15 -20 $/SF etc. I find data like that much more interesting and useful than overall costs. @ Doug: A house with 1200SF of exterior wall is a very tiny house :-). But I get your point and again, doing these calculations are better done per SF in my opinion. Interesting review of the cost to do a retrofit. While it is only four case studies, I would be interested to see what drove the variation of costs as they don't always seem related to the sq. foot. Was it due to different strategies that were employed? The article didn't provide a lot of detail about each home? I would also love to see a similar review of homes built between 1950 and 1990, rather than the 100 year old homes shown. Homes built after the 1950's seem to be the most logic choice for focus as they account for the bulk of US housing stock. Sure, we could tear them down and build new, but to me that sounds like a terrible waste of resources. I did the heat loss calculation on a square foot basis, use any size home you like. A 1,500 sf rambler with full basement is 3,000 sf, not exactly a hut. An energy upgrade for any building must start with the proposed energy saved and the cost for the building improvement, a real world calculation. You're right that there are several ways to install additional wall insulation on the exterior of an existing house. People have been using Larsen trusses for this type of retrofit since the early 1980s, and Peter Yost, among others, has used spray polyurethane foam. Costs will vary from region to region, depending on local labor costs, local insulation costs, and how familiar local workers are with chosen techniques -- so it's hard to generalize about which approach is cheapest. However, here's my take: People who are expecting a breakthrough that will result in much lower costs for deep-energy retrofits are likely to be disappointed. We've been doing jobs like this since the 1980s, and the work is very labor intensive. Most of this work is plain old fashioned ordinary carpentry. It takes time and attention to detail. I don't think it's likely that anyone is going to come along with a new invention or a novel approach that will significantly lower costs. Of course some contractors will find that in their area, Larsen trusses are cheaper than two layers of 2-inch polyiso. That's great. But I've never seen a deep energy retrofit project that could be economically justified based solely on energy cost savings. These projects are expensive, and they only make sense when the homeowner is willing to pay a lot of money for aspects of the project other than energy savings. 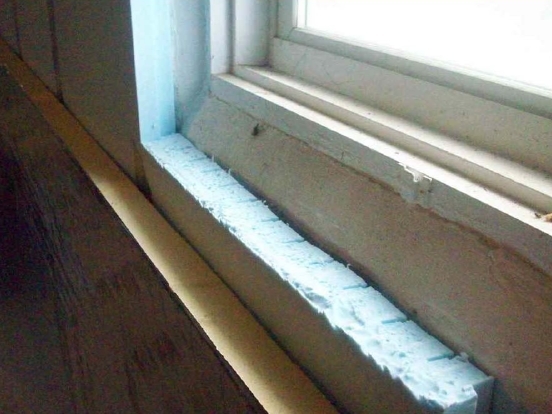 As many have said before, upgrade insulation levels when a house is due for needed work.. When windows and siding need replacement, this is the logical time to upgrade wall R- values. A new roof should bring with it questions and hopefully answers on solving ice dam problems, ventilation and heat loss. As a builder, I will try and improve the envelope first and then replace HVAC systems with high efficiency units when needed. Equating the quantity of PV that could be purchased for the similar dollar value of the deep retrofit is a bit misleading, for there are several drawbacks associated with solar PV that need to be identified. (3) Solar PV is rated on its ability to convert electricity over a 1 square meter of panel surface. I have researched in the past that in the Northeast US that equates to 3 hrs/day of usable sunlight at the full rating of the panel. For comparison, Arizona gets 11 hrs/day of usable sunlight. - The electrical loads go up in the house, because the occupants purchase more “electronic gadgets” (devices that require AC/dc converters) with the money not being spent on fossil fuel (heat). Deep retrofit is in its infancy, other than the chainsaw retrofits pioneered by Harold Orr and Rob Dumont, it has always been pursued as “one offs”, special cases. This work seeks to uncover the hurdles and provide more repeatable cases. In the next phase of this work we are looking to reduce the application /shell sq. ft costs to rival that of siding jobs, ~ $10 - $12/ssf. I appreciate the attention to the carefully explained detail, I mainly wish to distinguish the major differences between deep retrofit strategies and the main stream solutions that are sold in a box. Thanks for your comments, and thanks for your work with this excellent research project. I'd like to address several of your points. As I said in response to a previous comment on the topic of PV, I never intended my PV math to imply that I was advocating the installation of PV arrays on these houses. I merely did the math to provide some context to the energy saved at this project. You're right, of course, that a PV array produces no electricity at night. Fortunately, however, grid-connected homeowners (the vast majority of Americans) can usually receive a credit for PV production on sunny days, and can use that credit on cloudy days and at night. I agree with you that ground-source heat pumps (GSHP) are expensive, although plenty of people have managed to install one for less than $50,000. Like you, I don't advocate the use of a GSHP for most homes. However, many people have built superinsulated homes heated with one or two ductless minisplit units. It's possible to install a minisplit with one indoor head for between $3,500 and $5,000. When such an all-electric home is equipped with a PV array, the home can achieve net-zero-energy production on an annual basis, as I'm sure you know. Since we now know that it's possible to build such a home with a PV array as small as 5 kW, it does, in fact, make sense to evaluate energy-efficiency improvements by comparing the energy savings of the measures under consideration with the output of a PV array. There are many ways to compare the output of a 20-kW PV array in Utica with a saving of 393 therms of natural gas. You can do it in dollars; that comparison shows that the PV array produces electricity valued at 5 times the value of the natural gas saved. You can do it in kWh; that comparison shows that a PV array produces twice as many kWh as the energy value of 393 therms of natural gas. Or, if you assume that a ductless minisplit heat pump has a seasonal COP of 2.0, you could say that a ductless minisplit heat pump connected to such a PV array would produce 4 times the heat contained in 393 therms of natural gas (assuming that the gas were burned at 100% efficiency). Performing such a math excercise is no different from similar exercises performed by consultants on your project. No one can decide between R-60 attic insulation an R-5 basement wall insulation versus R-40 attic insulation and R-15 basement wall insulation unless you do the math. We all do the math on energy retrofit measures all the time. That's how we come up with recommended retrofit packages. I'm suggesting that we also include a little PV math in the equation when we evaluate these measures. That's not to say that all measures are equivalent. Your Rinnai tankless heaters certainly won't last as long as the polyiso you installed on the walls. But you still decided that the Rinnai heaters made sense. You mention that "PV has had almost 30 years to be developed to drive costs down," and that's certainly true. But we've been doing deep-energy retrofits using Larsen trusses for 30 years too. And costs haven't come down very much (although windows have gotten a lot better). You wrote, "I have researched in the past that in the Northeast US that equates to 3 hrs/day of usable sunlight at the full rating of the panel." I took that into account in my calculations. The PV output information in my blog is the output in the Utica area, using the PVwatts online calculator. I'm well aware of the low levels of PV output during winters in upstate New York and northern Vermont, because I live in northern Vermont and I have a PV array. You wrote, "Air quality, safety (removal of auxillary heat sources), insurance premiums (no ice damming) , and building quality/integrity (look at hurricane aftermath photos, 2x4 stick walls w/fiberglass covering the landscape) are all improved from a deep retrofit." I agree completely. I even wrote something similar in my blog: "The retrofits resulted in very significant energy savings, and the gathered cost data are extremely useful. Before the retrofit work, the homes were drafty, uncomfortable, and out of compliance with local building codes. After the retrofit work, all of the homes have new siding, and some of the homes have new roofing and windows. All of the homes are safer, more comfortable, and less expensive to operate." Rigid insulation doesn't need commissioning and lasts a long time, and I'm a big fan of insulation. But no one is going to spend $100,000 to save $647 in energy costs per year -- at least not for the energy savings alone. The only people who will do that are those who want the other benefits: new siding, new roofing, fewer drafts, and a safer house. A well-designed and implemented solar thermal system can collect 3-4 times as much energy per square foot as a PV system. I personally wouldn't do it in Utica, but a solar thermal system should be a better investment than PV. While you are expressing a commonly held position, I believe that you're wrong. You can't assume that all of the heat collected by a solar thermal system is used. In fact, it isn't, because the time that the heat is collected doesn't correspond well with the time the hot water is used. For much of the year, a good portion of the collected heat is wasted. In contrast, a homeowner with a grid-connected PV system is credited for all of the energy produced by the PV system. Once you take these factors into consideration, it becomes clear that it's now cheaper to make hot water with a PV system connected to a heat-pump water heater than it is to use a solar thermal system. There are exceptions, of course -- especially for laundromats and college dorms, which have a huge need for hot water. I just wanted to relate a few experiences with this errr, process. The upside, as mentioned, of doing energy retrofits when other home components need replacing is indeed true. The real problem is that when doing a more complex renovation, there are many diverging priorities. Not the least of which is the attention span of the project manager. In my own case we bought a house that pretty much needed everything, The roof leaked, the furnace was 40 years old, avocado bathroom, 500 sq ft deck waiting to fall down etc. Besides these things and a small amount of interior rejiggering, I intended to do quite a bit of energy mods. Things do not always come in the order you want for energy efficiency. The roof must be first, cannot fix a house under a leaky roof. So in with the thousands of other decisions, we have to decide on insulation thickness aesthetics etc. Second we cannot start demolition until the boiler is moved, so we must purchase and install a new boiler with only a wild guess as to what it will really be heating in the end. Then , of course, some aspects of the project become more time consuming than anticipated, so we call a contractor to do a simple job I am running out of time to do. Strip the lovely grass wallpaper. Turns out stripping the wallpaper off of bare sheetrock and fixing it, and painting it would cost as much as new sheetrock. Now all of a sudden we can sprayfoam exterior walls. Which means when we work out the budget[budget, what's a budget?] that we get to replace about half the glass with much better glass. It turns out for various reasons two windows need jamb extensions. Oh, did I mention the house has no interior or exterior window or door trim? Turns out my jamb extensions look great, so great, that if I had had 2 seconds to think, I would have added at least an inch, if not 2 of foam to the interior walls. But you see, there are thousands of decisions to be made, and no one is stopping in the middle to wait to sort things out. Oh, did I mention our winter rental was two and a harf grand a month? Are ya, are ya seeing my point? There is an elegance to doing an energy retrofit in its own right. If my my new home was not seemingly in danger of falling the hell down[it was in fact amazingly solid after 40 years, built by a DIY] I could have both saved money and made a more energy efficient home. A blindingly inaccurate total guess based on r values and degree days says my house would have used about 1560 gallons of oil to heat a year when we bought it. The PO did not really heat it. My neighbor told me a very popular local handyman stayed here one winter. He came to them one day and asked if he could sleep at their house that night. "It is so cold over there"
The same calculations tell me with my current insulation levels I should use about 550 gallons of oil. We actually[last 12 months running] have used 640 total, with a minimum of 150 being for hot water. So the calculation is say 15 percent high. Since I am pretty sure that as r values drop, this [pretty rough] estimate gets worse, lets say my old level was 25 percent high, putting actual usage at 1170 gallons. So in real big ballparky numbers I may be using 650 gallons less heating oil a year, which is a pretty good investment in my eyes. Let us put a fine point on that. After upgrading the remaining glass to ~R5, insulating my foundation and several other of my 10 year punch list items, I would have to increase all my insulation 4x to reach PH levels. Just as a frame of reference. If your primary goal is just living in the damn house, combo renovations are very complicated. Dealing the hand you are dealt with kind of overwhelms everything else. Martin how do you do it? You are saving 650 gallons of fuel oil a year. If the oil costs $4 a gallon, that's $2,600 per year. You spent $60,000 on your energy measures, so the simple payback period for your investment will be 23 years -- much better than the Utica project. I had it in my head that our tenant[we rented it for a year before we sold our house] had used the same oil company, but not so. She heated it pretty straight up, it was always warm when I went in to try to fix a roof leak. Maybe I will find out who she used and get a real number. Of course if I ran into her and she shouted to her friends 'hey there's the slum lord' and her friends nodded knowingly, I would have no choice to smile and wave. She was a saint really. The article stated that "All are owned by low-income families who had applied for weatherization assistance." We performed a similar program of deep energy retrofitting twenty pre-1978 homes in Northern California for folks below 80% of mean area income level. (The work was featured in the ASHRAE January 2012 issue under the "Measured Home Performance" article by Lew Herriman and Rick Chitwood.) Even with hundreds of applicants and the resources of the electric utility, we were surprised by the difficulty of locating homes with nomal energy use, let alone high use, due to the simple fact that these folks couldn't afford to buy much energy to begin with. Forget about the amount required to be comfortable. They simply went without it. What we found, post retrofit, is that nearly everyone had expanded their comfort levels to now be quite comfortable. And since these projects were also 100% free to them, at about $25 thousand on average, the term "take-back effect" didn't seem an accurate term (since they never contributed) for their behavior. The average savings were between 30 and 40 percent of total energy use, despite the comfort increases, and despite leaving most of the low hanging fruit on the tree for them to tackle over time (CFL's, water heating, appliances). I wouldn't argue that these (4) homes would ever pencil to be "cost effective" according to typical definition, but I would suggest that the payback would've looked looked better had the 1) owners paid for the work and 2) the homes had been operated the same way for pre, and post, retrofit. 1. Local materials and local labour are drivers of healthy communities. Buying systems from other parts of the world decreases the real wealth of a community. We as a community and a society need to find a way to give value to these local aspects of projects. 2. The costing should be given for different energy price projections. If energy prices triple then the payback period will shorten considerably. Even if the worst case scenario doesn't happen there is an "insurance factor" that has some value. 3. At some point carbon costing will likely be a part of the picture. 4. What value do we put on a healthier and more comfortable home? Not to mention the value for a home that will remain quite livable during an extended power outage (or with a minimal backup to run ventilation). 5. A better built house (tight with ventilation) lasts longer - adding systems adds nothing here here. If all factors are given fair value then the deep retrofit is much more economic than it seems at first glance. To get from 50% to 75% would cost 3-4x more and would be characterized by 50-100 year payback times, so not an easy sale. We'd have to change out perfectly good windows, replace nearly every major appliance as well as retrofit wall insulation. In short, not cost effective. All of your points are pertinent. So, if you want to help support your local economy, and you expect energy prices to triple, and you value the increased comfort that accompanies the type of work described in this article, and you are wealthy enough to afford a $100,000 retrofit, then I say -- go for it. Just make the leap with your eyes open, fully cognizant of the low savings-to-construction cost ratio. It sounds as if you have come up with a climate-appropriate, cost-effective package of retrofit measures that works for your customers. That's good. And I agree with your point about achieving deeper savings: the last few BTUs you save are always much more expensive than the first few BTUs you save. We've been DER-ing our old house (www.thegreenedhouseeffect.com) and had to answer many of these questions. It was unquestioningly cheaper to DER than to raze and rebuild, but it was still expensive. Not all of those expenses, however, can be attributed to the "DER" portion of the plan - we couldn't justify charging the roofing to the "DER Account" because it needed to be replaced anyway. We also couldn't charge the base cost of new windows, since they were in need of replacement as well. And then there were the simply aesthetic upgrades and the premiums we paid for more durable materials over the cheap stuff. We also used the opportunity to replace a small garage addition, which coudn't be attributed to the DER. And on PV - our 4kW system had a price tag of $32,000. My local installer would charge a lot more than $89,000 to install a 20kW system! And then there have been the comfort and healthy IAQ dividends, not to mention the benefits to the Economy, Environment, and National Security from energy efficiency. There's a good argument there that society, through incentives, should be supporting deep energy efficiency for all of those reasons. So, for us, the "new home" quality that we now enjoy came at a cost, but not the cost of either scrapping what we had into the already stuffed-full landfill or eating up another parcel of open space for a new home. And we subsidized the benefits that our country as a whole will receive from our project - stimulating the Economy, cleaning up the Environment, lessening our use of the healthcare system, and lessening our dependence on foreign sources of energy. Not to be disrespectful, but without including all of these externalities (not only environmental costs), the dollar figures don't mean a whole lot. And comparing those figures to coal-generated power that is highly subsidized and extremely detrimental to the enviroment on many levels is a little misleading, too. Sure, it's complicated, but it's important that those of us involved really try to get the whole picture, not just a rock-bottom simplistic view. "However, the energy savings alone can't possibly justify the very high costs of this type of retrofit." Sure, but what would be the alternative? Leave the house (and the all other several thousands of homes) alone. Screw comfort, safety, energy savings (even though they are small) and global warming? I don't want to be cynical - just looking for an alternative to the DER that could take its place. Q. "What would be the alternative?" A. My own proposed alternative is to perform retrofit measures that yield energy savings per invested dollar equal to or greater than an investment in a PV system. The Utica retrofits went well beyond such common-sense measures. At the risk of getting lost at the end of 50+ comments, I'll add my two cents. I think Martin's latest posting was an excellent follow up to the "Pretty Good House" discussion of the past couple of weeks. I worked on 6 DERs with a goal of 50% annual source energy savings as part of SMUD's R&D efforts(you can read the case studies @ https://www.smud.org/en/residential/save-energy/success-stories/projects.htm). NREL assisted us in this effort providing energy analysis,. monitoring and evaluation support. I'll also be presenting a paper of the projects at the upcoming ACEEE summer study session. which provides more details about costs and savings, including monitored results to date. I mention all this because it's critical that we get real data and monitored results from these efforts, especailly given the high costs associated with these projects - costs that are often subsidized by utility rate payers. - DERS are expensive but provide unquantifiable benefits including increased comfort, rehabilitating abandoned, foreclosed homes, providing low income families a decent place to live, etc. therefore, DERS should be undertaken as part of bigger efforts to rehabilitate housing and not necessarily be undertaken for their energy savings alone. - intelligently packaged efficiency packages geared to specific climate zones and housing vintages can lead to large energy savings. The rule of thumb being is to bring the home up to new construction levels. - peak demand savings are under appreciated by utillities and represent far greater value than simple therm or kWh savings. In particular, DER programs should be geared to reducing AC (and heating) equipment sizing and utilities should seriously consider paying for right sized equipment rather than kWh or heating therms. This will require a major re-think on the part of state utility regulators and utilities. - we need to be very careful about claims about overall electric savings as the explosion of plug loads can easily overwhelm thermal electric (AC) savings (all electric homes are the exception where huge savings are possible). To conclude, then, I'll echo what I said about pretty good homes, which is that the pretty good home approach is what we should be aiming at with a special focus on right sized equipment in DERs, say 30-50% savings. Quite simply, the scope of the challenge - dramatic energy savings in a very short period time and re-starting our construction industyr -demands that we come up with simple, easy to replicate models on a mass scale - read millions - if we hope to make any kind of impact. Thanks for you pertinent comments on the need for a climate-specific approach. I think the focus on efficient air conditioners, PV systems, and peak electricity reductions are very important in California, but obviously less important in Utica. Appropriate energy-efficiency measures will certainly vary by climate. Of course, the project costs listed above (except for the $25,000 project) include a variety of measures, not all of which were directly related to energy improvements. Some years ago my neighbor asked us to look at her manufactured home to try to make it look more like a normal home. It had rotting siding (pseudo-Swiss-chalet), no eves, a 1/12 roof pitch, enormous windows on the west end, and dark interior paneling. And it turned out that the builder had used the entire uninsulated attic as an air return to the furnace/AC. The architect and I designed a $30k retrofit: a nicely pitched roof with 2' eves, extending a full 10' to the west. Low-E windows and glass doors, R13 fiberglass in place of the rat-infested R7 in the walls, and an uninterrupted layer of R30 over the old roof deck created a home in which the dog could no longer hear cars enter the drive, the propane tank needed filling less than half as often....and the AC ran for a few days a year rather than weeks. They raved over the comfort and saved at least $2k per year while the efficiency improvement costs probably took under $5000 of the budget. I've come late to this discussion, but if nothing else, I'd like to thank Martin for one of the first and most interesting pieces--and valuable comments from others--concerning the issue of DER cost. Nice to see some numbers getting posted, even though we have a long way to go, still. A matrix of features and conditions will go a long way to highlight likely house candidates for DER, and then, presumably, market sizing can be researched; for instance, there are figures showing percentages and gross numbers of housing getting re-sided each year. Unfortunately, even when a house's roof , siding, and windows need replacing, DER still contributes significant expense. The other thing needed is a method for bringing down the cost of DER, and I'm glad to see Greg Pedrick, of NYSERDA, funding some further field trials related to DER cost reduction. 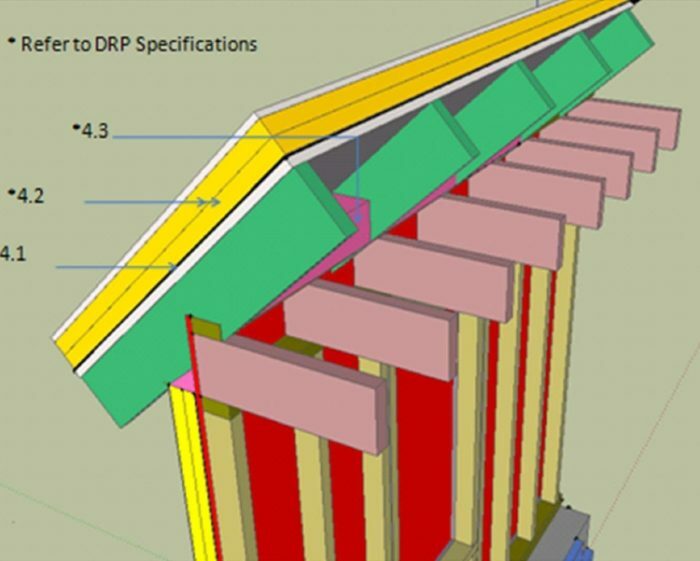 DER, today, remains a one-off process with few efficiencies available; one study suggests that the current practice of exterior DER requires 8-10 trips around the structure (siding demo, various foam layers, taping, sheathing, siding, etc.). RetroSheath (www.RetroSheath.com), patent-pending, is an effort to systematize exterior DER, leveraging both digital technologies (measurement capture, CAD and CAM software) and existing materials and processes (R-Control's Nailbase and Premier Panel's ci Panel, to name two, and closed-cell soft foam sheets) to reduce labor costs, both from less time spent on site and the use of general construction labor, as opposed to the very highly skilled DER contractor crews currently required. 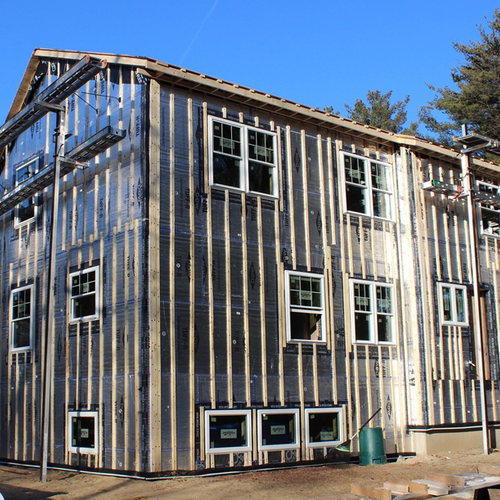 There are one or two other potential cost reduction processes, such as encapsulating old siding instead of removal and remediation, and window/door build-out or extension methods. There's plenty of information available on the RetroSheath site. I've been searching for partners, either as fellow field trial participants and/or to help move the provisional patent into a full (utility) patent application. DER may not be, in the near term, a huge market, but it is likely a big enough market, especially in the Northeast, where housing stock is old and amenable to DER, at least where the infrastructure of natural gas isn't available! The next step for RetroSheath is to determine the real level of cost reduction available through its process, since every point of cost reduction expands the potential market for DER. I need to move from back of the envelope figures to some real cost analysis. Comments welcomed! I just did some quick math, and if you are looking for a green-built house, a DER still makes more sense. A weighted average of the costs (not including the unforeseen complications) comes out to around $46.16/sqft. Including the unforeseen (which is much more variable, depending on the condition, age, location of the house) and that bumps up to $75.80/sqft. That is still reasonable compared to the costs of a super energy efficient new home, I would think - not to mention better on the environment from a life-cycle analysis standpoint. I think it's important to note that the unforeseen complications can become more foreseen with experience and are incredibly variable (as seen in those four examples above), so it would probably be better to assume $50-60/sqft for a DER on an older home (100-ish years), less for a newer one. I'm sorry to hear that you paid $8 a watt for your PV system. If you bought it today, there's no reason you couldn't get the same system for $4.50 to $5.00 a watt. Of course, you're right that the value of a deep-energy retrofit is equal to whatever the client is willing to pay. You seem to be happy with your choices -- so it's worth it. Those looking for policy solutions to our climate-change crisis face a different type of arithmetic, however, and it's hard to imagine that our country will be able to afford to spend $80,000 to $120,000 per house to reduce energy use. While every deep-energy retrofit is a valuable exercise, no one has yet come up with a way to achieve deep cuts in energy use in a way that our society can afford. The rapid drop in PV prices is changing the economics of deep-energy retrofits month by month. In many areas of the country, a PV system -- as big a system as you can squeeze onto your roof or south lawn -- has an immediate financial payback. Surprisingly, you can't say the same for 4 inches of foam or triple-glazed windows. Good article, but bad headline: I'd suggest that "DER costs from $44,000 to $70,000" would be more accurate. Why? Obviously you take out the "unforseen conditions" because replacing the lead water main is not an energy issue, even if it's a really good move! Also, my numbers come from abandoning the basement retrofit because I'm advocating for making the basement ceiling the boundary layer for the energy envelope of 100-year old houses. Yes, you CAN insulate their basements and it's a good thing, but the basement did not start as conditioned living space so adding cost to even get it in that direction is a good way to burn up the budget. Again, nice and def. can add to energy overall savings if you do it, but you can fix and insulate plumbing and build a small insulated room around mechanicals for far less $$. I'd submit that many of these comments get at the difference between a "pretty good" or Moderate Energy Retrofit vs. NYSERDA research version DER. Starting with buildings that are in bad condition, some of which were never designed to be comfortable, just skew the "DER" numbers more, even if the exercise is instructive! Thanks for the article Martin and GBA! Construction and building science are my avocations, but I get paid to design and install solar PV. The use of solar economics as a foil to the cost of a DER are a good exercise, mostly because solar PV is so easy to measure in kWh output. Meanwhile Btu's moving unseen in and out of a building are hard to measure, especially over time. Of course, the Btu's you needed to be comfortable but were not there are never measured, so we toss them an analysis black hole called "comfort". For me, comfort included quieter house to work and sleep in, elimination of annual yellow jacket invasions by closing up all holes in walls and properly venting the roof in a wasp-proof way, eliminating the need for AC except on high humidity days, and not worrying about running out of oil when I'm out of town. Forgot that new trim, sidng and windows make me comfortable to point at the house and say "it's mine"! 1) the environmental cost of PV is definable and as someone who has actually manufactured solar panels, just cut it out and stop kidding me will ya? 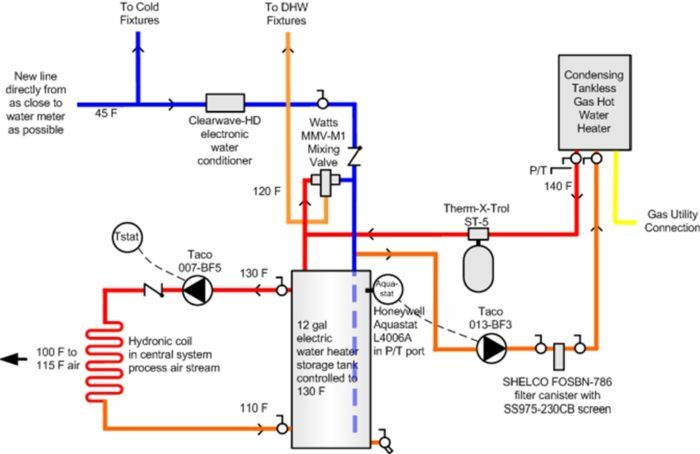 Here's the short answer: there is some water use and some very, very controlled hazardous chemical use in making solar cells. There is less and less energy use to make a watt of solar, mostly due to the same crystal being cut into more (thinner) cells and less waste in every feature of every stage of production. BUT EVERY OTHER FORM OF ENERGY (except wind) uses LOTS of water! Yes, the answer is water makes all the difference because getting water, treating water, cleaning up the water, even discharging the water - it all uses lots of energy. This is now known as the "water-energy nexus" because the two are interlinked so thoroughly. Unless you use PV or wind which use NO WATER post manufacture. They also use about no fossil fuels post installation where as even nuclear and hydropower (much less) use fossil fuels for operations and maintenance and getting rid of waste is kind of a big thing, too. The other big joke about even bringing up the idea of "factoring in PV's environmental impact" is that PV reduces the centralized transmission of electricity because it is generated at distributed points on the distribution grid (aka "distributed generation"). The largest, most complicated "machine" in any developed country is the electricity grid and it costs trillions of dollars to maintain and millions of tons of CO2 to operate, but has a final efficiency of less than 40% by most estimates. PV on your house supplies electricity about 40 feet from the source over a wire that requires NO maintenance and some significant % of the time, does it at the exact same time that your house would otherwise demand peak load from the most complicated and subsidized machine in the country. I call that a pretty good substitution in any environmental terms you choose - and that's not counting the complete avoidance of water use. 3) PV costs for residential installs as of 2016 are $4.00/W dc or less mostly. Any custom system installed at your house (incl. all PV) can vary a lot, so your mileage WILL vary. However, solar PV is really an after-tax deal which is my final comment on beware of comparing PV and DER: it is harder to figure as a true comparison due to this, all the POSITIVE environmental benefits of each that are "externalized", and the fact that PV generally is forgotten about once installed. Outside of taking some heat out of your sunny areas of roof (40 deg F on back of roof sheathing on a hot day), PV will not add to your Btu comfort like a DER will, it doesn't make your house quieter or healthier, and it will not keep insects out of your walls.